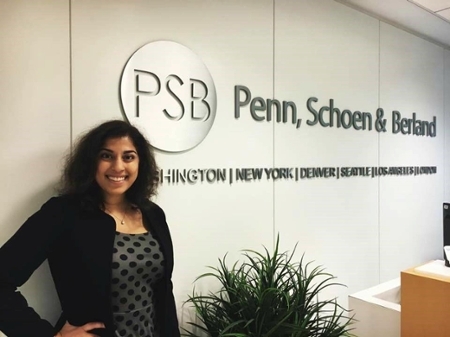 Why did you apply to intern at Penn Shoen Berland Associates? Last spring, I took a polling research class through the Purdue Institute for Civic Communication, and we worked with Penn Shoen Berland to field our poll. The work really interested me – that is, supporting policy, strategy, and communication with facts. Gauging how people feel about things through polling – whether it be a product, a political figure, or an idea – is extremely important to make sure people know in what direction their messages and products should be heading. Every day is different for me. I wake up at 7, exercise, and take the metro to work at 9:30 so I can be in the office by 10. I work until 6, with about 45 minutes for lunch. The days are long, but usually I start the day off easy – with some presentation work. Then usually there are meetings before and after lunch time – to discuss our clients’ initiatives and how the polls are fielding. After meetings, it’s standard script testing, where we check to make sure the questions in our polls make sense and the logic for the programming makes sense. Getting to work with big-name clients is very exciting. My team works with a lot of public nonprofits seeking to get messaging advice, but we also work with private clients, big banks, and other companies. Interns are given as much responsibility as they can handle – so if you want to take a bigger role, the team here is really supportive with that. Another exciting aspect about my role is that I’m working directly with the data, so I am involved in the process of polling from beginning until end. I get to learn a lot of cool new software (which is not up my alley as a liberal arts major), but then I get to apply results in a creative way that hones in all the skills I’ve learned as a philosophy and political science student. Living in Washington, D.C. by myself has taught me so much, like how important it is to have a work-life balance. This internship teaches you to work very hard, and to make sure your work is the highest quality possible. Being detail-oriented and learning how to take care of yourself is crucial to being successful in any career. My internship also taught me that no matter what career you’re in, most of your work involves being part of a group. As liberal arts majors, we are far removed from the reality of group projects since we are so used to doing every assignment and writing every essay on our own. But that isn’t what working in the real world is like. Developing people-skills, having good communication, and respecting others are just as important as being smart. Stay hungry and stay humble. You can be the one to go grab coffee, but you can also be the person to take a leadership role on a project. Never treat anything like you’re too good for it, but never think that you are not capable of doing something. Here’s the thing – no one is coming for you, so stop waiting. No one is going to hand you an internship. Go out there and take those opportunities. Get a mentor, build your resume, and remember that everyone starts somewhere. Good things don’t come to those who wait – good things come to those who work persistently towards their goals and are patient.